Transit-Oriented Development can provide a convenient umbrella to coordinate many existing City programs while implementing the principles of sustainable growth. The establishment of TOD Overlay districts to foster TOD is one means to creating a more livable city. Boston’s history of growth and development has been closely linked to the development of mass transit. As trolley lines expanded beyond the downtown core during the later part of the 19th century, new neighborhoods formed around this access. Many of the factors that made these streetcar developments successful a hundred years ago are still valid and can serve as models for encouraging development in the City. Transit-Oriented Development was one of the tools for sustainable growth identified during the Boston 400 planning study. The results of successful TOD include development focused around transit access, allowing for less reliance on cars; creating more walkable neighborhoods where it is convenient and safe to do errands on foot or by bicycle; and promoting mixed-use neighborhood centers that provide goods and services within easy walking distance. 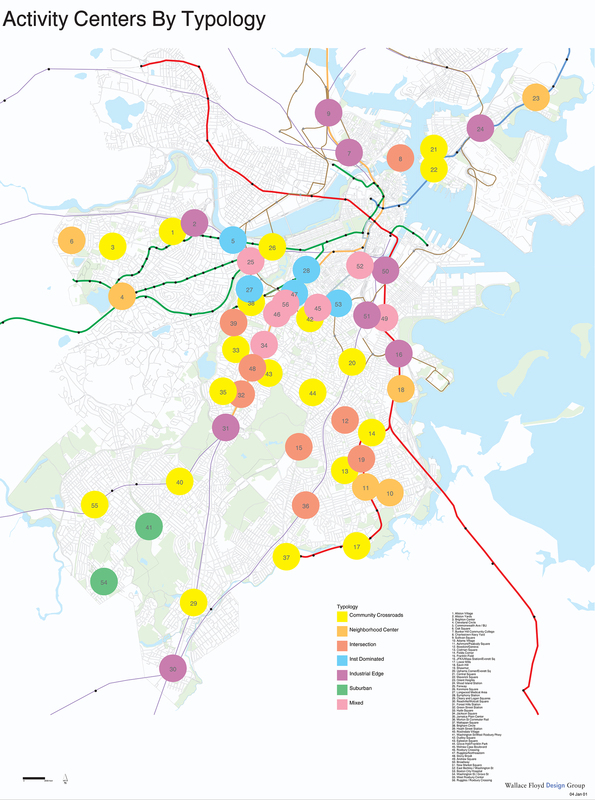 The Boston Redevelopment Authority undertook the TOD study in order to understand the potential of TOD within Boston and to develop policy guidelines for implementation. It looked at 56 candidate sites throughout the City and established criteria for rating their potential for success. The more promising sites were divided into distinct typologies in order to identify stakeholder relationships and land use patterns. Several sites were looked at as prototypes to investigate policy alternatives on parking requirements, density of development, and mix of uses. In 1997 Mayor Tom Menino formed a taskforce to undertake a long-range planning effort for the City of Boston, named Boston 400 because the plan looked ahead to 2030, the year of the City’s 400th birthday. One element of this effort consisted of determining the potential for TOD as a redevelopment and reinvestment tool for the City’s neighborhoods. Mayor Menino and his administration also considered TOD a significant tool to reach the administration’s goal of 5,000 new housing starts in Boston, as the project would identify areas where residences could be constructed near transit, allowing for an increase in housing without a commensurate increase in traffic on city streets. Through TOD, Boston has the opportunity to reduce its dependence on the car. Due to the region’s extensive public transit system, Boston, and many similar communities, can take advantage of TOD as a means to provide more opportunities to live and work close to an alternative means of travel that is safe and reliable. Through TOD, Boston can help to reduce the single biggest reason people use their cars, which is to get to work, and thereby reduce sprawl and traffic congestion. Successful TOD requires a large population living within easy walking distance of a transit station or bus stop. This is generally considered to be a five-minute walk, or roughly a quarter of a mile, although a ten-minute walk, half-mile radius is often cited strictly for transit users rather than shoppers. Our study focused on the quarter-mile radius. Population density is frequently talked about in terms of dwelling units (DU) per acre, and 12 to 15 DUs per acre is often cited as the minimum needed for TOD. At this density a quarter-mile radius would contain about 3,800 to 4,700 people, using an average household size of 2½ people. Concentrate Development. Higher densities of use – whether residential, office, or retail – should be centered around the transit station. Concentrating development places many residents and employees within walking distance of the station and can contribute to increased ridership. By creating denser development around a transit station, the surrounding neighborhood character can be preserved. Encourage Mixed Use. Mixed land uses bring vitality to the area throughout the day and provide convenience retail – such as restaurants, dry cleaners, video rentals, and grocery stores – in order to encourage walking trips for daily needs and errands. Provide Alternatives to Driving. Reduction of reliance on the private automobile and the number of trips by car, as well as shared parking and a pedestrian-friendly design, encourages a park-once-and-walk attitude. Build Seamless Connections. Travel to and from the transit station and in the surrounding commercial area should be a convenient, safe, and pleasant experience for the pedestrian and bicyclist. Improve Streetscape Design. Good urban design principles – including buildings oriented to the street, attractive signage, and active storefronts – are more important than ever. Highlight Transit Stations. The transit facility – whether it’s a subway station or a bus stop – should have high visibility and make a positive contribution to the identity and character of the area. The approach was to categorize the 56 potential sites and reducing them to four selected sites to be used as prototypes. The first part of the project involved taking an inventory and making an evaluation of all of the potential sites. The second part was to prepare development scenarios for the four prototype sites. And finally, we would make recommendations for the establishment of a citywide policy based on the work prepared for and lessons learned from the four sites. The field survey team rated each site based on the following criteria: available land for development; the number of commercial or professional establishments within the area; commercial vitality; physical attributes, including pedestrian friendliness. The criterion for selecting a particular site for further study was replicability – the measure of whether a particular site is representative of a typical condition so that ideas developed for one center can be transferred to other, similar sites. Mixed : an area that falls into two or more of the other typologies with none dominating, such as industrial and residential developments divided by a highway. The final four sites were Uphams Corner, Mattapan Square, Sullivan Square, and Ruggles/Roxbury Crossing. The physical differences between typologies were obvious, and they also revealed the differences that would be necessary to implement TOD in the various typologies. Older, denser cities have land use and ownership patterns that virtually guarantee the involvement of many different parties to put a development together. Contrast this with a site in an industrial location that is ripe for redevelopment. The city would play a leading role in planning to insure the right mix of uses and infrastructure improvements, such as new roadways, are included in order to attract developers. The lesson here is that each typology will require a different mix of stakeholders, deal structures, and funding to insure a successful TOD even though the policy goals would be citywide. Each TOD project will have a different proponent – sometimes the city, sometimes the transit authority, and sometimes private developers – but most will require complex negotiations and financing among many stakeholders. The BRA is responsible for the City’s economic development, including zoning and design review. Much of the implementation of a TOD policy needs to be carried out by other city agencies and the local transit authority. A number of strategies to implement TOD are within the purview of the BRA and are considered the foundation for developing other strategies. Primary among these is the establishment of TOD Overlay Districts within the zoning code. The following summary highlights some of the strategies currently under discussion for each of the six principles. Provide more housing and employment opportunities within transit-oriented development overlay districts to encourage walking trips for daily errands, and increase use of public transportation. Maximize the density of development that can be built without significantly altering the character of the area. Encourage residential or office uses over commercial uses in overlay districts. Allow for greater densities within the transit-oriented development overlay district but encourage the highest densities closest to the public transportation facility. Increase development density to reach 15DU/acre within the transit-oriented development overlay district as a minimum. Make the neighborhood convenient by providing a mix of land uses that will create a 24-hour neighborhood – such as restaurants, dry cleaners, video rentals, and grocery stores – in order to encourage walking trips for daily needs and errands. Make the neighborhood safe by providing increased on-street surveillance. Do not allowed auto-oriented uses such as gas stations, car sales and car repair within a transit-oriented development district. Encourage civic, cultural, and entertainment venues in addition to housing and commercial uses. Include affordable housing as a component of any residential development larger than 20 units. Establish a balance of residential, commercial and other land uses that reinforce one another in a shared parking concept. Develop alternative long-term parking that is safe and secure for residents. Encourage alternative means of travel that do not require car ownership. Manage on-street parking to reduce all-day parking along commercial frontage. Provide space for car sharing programs, taxi stands, and delivery vehicles. Establish reduced parking ratio of 2 spaces/1000 SF for commercial use and 1 space/unit for residential development. Provide Universal Accessibility for all modes and age groups. Allow pedestrians and bicyclists to have priority in situations where there is a conflict with motorized vehicles. Provide guide signs in a variety of languages, particularly around public transit. Use streetlights mounted on buildings to create more space on narrow sidewalks. Where a building street wall is not currently established along a narrow sidewalk, set new buildings back a few feet to increase the area for pedestrian circulation. Post and enforce ‘State Law Yield To Pedestrians’ signs, and speed limits. Encourage awnings over sidewalks near bus stops for additional weather protection. Recognize that the storefront and window display area are part of the public realm. Increase sidewalk areas by minimizing the roadway area. Do not combine blocks to form super blocks. With in large pre-existing super blocks create pedestrian easements to provide walkways through the block. Install a structural soil mix under sidewalks, when major construction provides an opportunity, to enhance the growth of street trees. Place off-street parking behind buildings rather than between the building and sidewalk. Use the minimum turning radius wherever possible. If surface parking is the only viable alternative, establish guidelines for edge treatment so that the lot reinforces the street wall. Provide facility entrances directly onto major streets. Provide guide signs from major parking areas, commercial centers, and other generators of pedestrian traffic. As part of Civic Architecture, include interpretive information about the neighborhood. Retail space included as part of the station should be located to serve the street as well as the station. Provide secure bicycle storage in a high-visibility area. The study developed a proven methodology for selecting potential successful TOD candidates in cities with many diverse neighborhoods and transit stations. In the course of selecting the most promising candidate sites, it became evident that the districts fall into a series of discreet districts, which we have labeled TOD typologies. The implementation of TOD programs in these various districts requires the involvement and collaboration among the varying stakeholders, neighborhood groups, institutions and commercial properties that are prevalent in each typology. Funding and financing mechanisms also vary within each of the TOD typologies. There is one prerequisite however: in each one of the differing areas, both the city and the transit authority must be committed to TOD at the highest policy level and must work closely together to ensure its success. Don Kindsvatter is senior urban designer at Urban Idea Lab. This article is excerpted from a paper published in the conference proceedings of a Transportation Research Board annual meeting.